Antony Calvert was today selected in a an open primary to contest the newly created Morley and Outwood constituency in West Yorkshire at the next general election. He already has a website up and running. The seat takes in a large chunk of the existing Morley & Rothwell constituency and part of the existing Normanton seat, which has been represented by Ed Balls since 2005. Colin Challen, the Labour MP for Morley & Rothwell, is stepping down at the general election to allow Mr Balls to stand in the redrawn seat. He will defend a notional Labour majority of 8,669 over the Conservatives (according to the Rallings and Thrasher figures), meaning that Antony requires, on paper, a swing of 10.5% to gain the seat for the Conservatives. The potential for a Tory victory here has already attracted comment in the local press and at the most recent council elections, the Conservatives did win more votes than Labour. The tally of councillors across the constituency is 5 Morley Borough Independents, 5 Labour, 4 Conservative and 1 BNP. Between 2004 and 2007, Antony was councillor for the Wrenthorpe and Outwood West ward on Wakefield council, which is one of five wards which falls within the constituency boundaries. For the last year and a half he has been the Media Relations and Account Manager for the community consultation company, Green Issues Communications. "For decades immigration was seen by many politicians (and much of the media “establishment”) as a no-go zone: multiculturalism and political correctness meant that this was a subject only fools, mavericks, extremists or political kamikazes talked about. And then came Sir Andrew Green. "Sir Andrew was a career diplomat, serving as the UK’s ambassador in Syria and then Saudi Arabia. Returning home to Oxfordshire, he has devoted his retirement to revealing the truth about what had happened in his absence: immigration controls had been relaxed – if they ever existed – and the result was the greatest surge of immigration in to the UK since 1066. "Deploying the best skills of the Foreign Office (forensic examination of the facts and a stubborn but courteous wish to get answers) - and with the aid of a small body of volunteers - he forced Ministers to admit what he and others suspected: no one had a clue who was coming in to the country, and that the concept of “immigration control” was a contradiction in terms. Overcoming the reluctance of the liberal media to report this, his efforts to see immigration debated on the basis of fact, not fiction, has made MigrationWatch UK one of the most successful political campaigns in recent years. Immigration can now be debated without those who question the benefits of large scale immigration being branded “racists”. "Sir Andrew himself now appears to know more about the workings (and failings) of the immigration system than most civil servants in the Home Office. Nicholas Soames and Frank Field, aided by him are now campaigning for all major parties to commit to balanced migration (when immigration equals emigration) to prevent the UK’s population hitting 70 million by 2028. "Should David Cameron put Sir Andrew on the red benches so he can reap the benefits of his expertise? It's a no-brainer: if Cameron really wants to get a grip on the immigration system, of course he should. The real question is whether Sir Andrew – whose mastery of politically neutrality has fuelled his success – would accept such an offer." Simon Reevell, a Yorkshire-based barrister, was selected at an open primary last night to contest Dewsbury at the next general election. He is currently chairman of Beverley and Holderness Conservative Associaiton. After considerable boundary changes, the sitting Labour MP, Shahid Malik, will be defending a notional majority of only 3,999 (based on the Rallings and Thrasher figures), meaning that Simon needs a swing of 4.5% to win the seat. Along with Colne Valley, Calder Valley, Bradford West, Halifax, Leeds North West, Keighley, Elmet & Rothwell and Pudsey, it is one of a number of West Yorkshire marginals all of which - on paper - the party needs to win if it is to form a government after the next election. Dewsbury last had a Tory MP between 1983 and 1987 in the form of John Whitfield. The previously selected Conservative candidate, Kevin Hollinrake, resigned last October to concentrate on his business affairs. Lynda Donaldson, a Conservative councillor in Rotherham, was last night selected to contest Rother Valley at the next general election. Since 2004 she has represented the Hellaby ward, which is part of the redrawn Rother Valley constituency. The constituency has only ever sent Labour MPs to Westminster, with the current incumbent, Kevin Barron, having represented the seat since 1983. He will defend a notional majority of 11,558, meaning that he would be unseated on a swing to the second-placed Conservatives of a little under 15%. "I would like to see Angela Knight nominated for a peerage. "Her promising Westminster career was brought to an all too abrupt halt in 1997 - after a single term as MP for Erewash - when her majority was wiped out along with so many others in Labour's landslide. "But in that short Commons career she made her mark, achieving ministerial office after just three years, serving as Economic Secretary to the Treasury between 1995 and 1997. Prior to becoming an MP, she loyally flew the Tory flag for five years as an elected member of Sheffield City Council - where she was a True Blue in what has often been described as the Socialist Republic of South Yorkshire. "With a chemistry degree and a career in business also behind her, after losing her parliamentary seat she went on to become the Chief Executive of the Association of Private Client Investment Managers and Stockbrokers. Since 2006 she has been Chief Executive of the British Bankers Association, in which capacity she has regularly been appearing in the media of late. "Angela still has lots to contribute to public life and she would make an excellent peer of the realm and - perhaps - could shine again as a minister in a future Conservative Government." Karen Allen was last night selected to fight South Shields at the next general election. Karen grew up in South Shields, went to Harton Comprehensive School in the constituency and her family still live there. She is a former member of the Conservative Future National Management Executive and is currently a member of the Executive Committee of Conservative Way Forward. Karen read English Literature at Queen Mary, University of London, after whcih she went to work in the City as a Lloyd’s Broker. She is currently employed as a Director at Tower Perrin, a global reinsurance brokerage, where she specialises in North American Casualty business. She will be challenging Foreign Secretary David Miliband in a constituency that has never returned a Conservative MP. After minor boundary changes, Mr Miliband will defend a notional majority of 13,368 over the Lib Dems, with the Tories close behind in third place. I learn of a boost for James Wharton, the Conservative candidate for Stockton South: his UKIP opponent, Kelvin Mirfin (pictured on the left with James on the right), has stood down, defected to the Conservatives and is now supporting James's campaign. “We desperately need a change of government and that can only be achieved by voting Conservative at the next general election. I have seen James’s work in the local community and I was impressed with what he is doing. I wanted to join his campaign because I am sure he will make a superb MP and because voting Conservative is the only way to get Labour out here in Stockton South”. Kelvin Mirfin is the second former parliamentary candidate to defect from another party to back James Wharton's campaign; since December 2007 he has had the support of Nigel Boddy, who contested Hartlepool for the Lib Dems in 2001. "I would like to nominate Dominic Lawson. "He of course the son of a serving life peer, the former Chancellor, Lord Lawson. But he has a wealth of experience of his own - primarily as an opinion former in the media - which would make him an ideal candidate for the Lords. "He was editor of the Spectator for five years in the early 1990s and went on to edit the Sunday Telegraph between 1995 and 2005. Today his byline continues to appear in a number of publications. "He is one of the foremost centre-right journalists of his generation and, despite not following his father into the House of Commons, it should be hoped that a man of his undoubted intellect and strong Conservative convictions could be put to good use in the Upper House." "I wish to nominate Nirj Deva, who is a Conservative MEP for the South East of England. Previously, Nirj was the Conservative Party's first Asian MP of modern times, representing Brentford and Isleworth from 1992 to 1997. Since 1985 he has held the position of Her Majesty's Deputy Lord Lieutenant for Greater London. Sri Lankan-born, Nirj first became prominent in Conservative politics in the early Thatcher years as an advisor to Willie Whitelaw. He was elected Chairman of the Bow Group in 1981. "Since he was elected to the European Parliament a decade ago, after drawing much attention with the energy of his campaign, Nirj has made international development his passionate focus, and boasts years of experience on the issue. "Tokenism need play no part in this nomination. Nirj is a rare as an elected Tory in his Asian ethnicity and expertise in development, but on this issue, and on race, he is robustly conservative - sceptical both of multiculturalism and of no-questions-asked foreign aid policies that enrich only dictators and their henchmen. One of the eurosceptic members of the Tory delegation, he has championed in Brussels a broad range of worthy causes, such as autism awareness, the campaign against child labour, human rights in Zimbabwe and - through the pro-life caucus, which he heads - the rights of unborn children. "As a member of the House of Lords, Nirj could contribute his passion, his experience and his conservatism to the deliberations of the Upper House. From these benches, he would also be in a position, if asked, to contribute at the ministerial level to the next Conservative Government's policies towards the developing world." It should be noted that after this year's European elections it will no longer be permissible for an MEP to be a peer sitting and voting in the House of Lords (since MEPs will not be allowed to have a dual mandate as a member of a national legislature). As such, if Nirj Deva were to be nominated to the Lords, he would have to relinquish his place in the European Parliament. "I would like to nominate Councillor Mike Whitby. "He has been the Conservative Group Leader on Birmingham City Council since 2003 and the Leader of Birmigham City Council since 2004. As leader of Europe's largest local authority, Mike Whitby has managed the local authority of Britain's second largest city in coalition with the Liberal Democrats for the last five years. "Under his direction, Birmingham City Council has returned a below inflation Council Tax rise of 1.9% for the past four years, making Birmingham's council tax the lowest average across 3 years for any Metropolitan Council in the UK - despite Birmingam's audit star rating going from zero in 2004 to 3 stars in 2008, breaking a stranglehold of Labour control. "He is also a former parliamentary candidate for the Welsh seat of Delyn in 1992." "When Janet Daley speaks the Left is terrified. Her defence of aspiration inspires. Her common sense is admired by those who pay the price of socialism through NHS waiting lists, bad schools, and unsafe streets. "As a Berkeley student, she rebelled against the suppression of free speech. When she emigrated to Harold Wilson’s socialist paradise her Left-wing illusions were shattered. She was shocked by a working class which saw ambition as “putting ideas into one’s head”; by Left-wing intellectuals who ridiculed upward mobility as bourgeois sentiment; and by an upper class differentiating through secret customs. Janet Daley is a meritocrat who wants Joe Bloggs to shine – a sentiment which was turned into popular policies under Margaret Thatcher. "Being plunged into the darkness during the Winter of Discontent made things very clear for Janet and many others. She understood that when the population is pushed into state housing dependency, self reliance goes out of the window. She highlighted how the state health service resulted in shortages for all. She sees the disappearance of discipline in the classroom as the result of a permissive education. When Islamic fundamentalism shows its totalitarian aversion for human rights and freedoms, she calls it fascism. "Janet challenges the Left’s dogmas in numerous articles and media appearances. She wants to liberate ordinary people from the shackles of the state. For this she deserves the ermine." You can read Janet Daley's blog here on the Daily Telegraph website. "I nominate a selfless, devoted pillar of the community, Dame Marion Roe, who vacated her commons seat in 2005 to make way for young blood, but continues to work tirelessly for a number of causes both social and political. "Dame Marion was Conservative Member of Parliament for Broxbourne between 1983 and 2005, and briefly served as an Environment Minster in Margret Thatcher’s Government. She chaired both the Health Select Committee and the Administration Committee during her 22 years in the House of Commons and was also joint vice-chairman of the 1922 committee. "Before entering Parliament, she served as a Bromley councillor and spent nine years on the Greater London Council. "When she stepped down from Parliament, she did not put her feet up or slow down, but continued to help, support and make a difference daily to people's lives. She founded and lunched “the Roe Project” - a mentoring and public speaking programme developed to help candidates overcome public speaking anxiety - and continued with other community undertakings. "After over 30 years of public service, Dame Marion still has tons to offer to Conservatives and the country at large. I would love to see her sitting on our side of the Lords." This video is of a recent Daily Politics report into Steve's campaign to bring Winchester and Chandler's Ford back into the blue column. East Lindsey District Councillor Victoria Ayling has been adopted today to overturn a projected Labour of 15,512 7,654. "I’d like to nominate Sir Robert Balchin, the Conservative educationalist and Pro-Chancellor of Brunel University. Sir Robert was a key adviser to Margaret Thatcher and John Major in government, and as Chairman of the Grant Maintained Schools Council did more than almost anyone else in those years to advance the cause of school freedom. Since the Conservatives have been in Opposition, he has remained an adviser to successive Shadow Education teams as Chair of the Education Commission and President of the Conservative National Education Society. “In 2005 David Cameron asked him to chair a review of Special Needs provision, and his Commission’s reports have continued to inform policy in this area. There are precious few Conservative-leaning education experts, and Sir Robert is rumoured to have turned down overtures to join New Labour’s big tent when others gave into temptation and were bought off with peerages or advisory positions in Tony Blair’s government. He has been a teacher and lecturer and has many charitable interests, as Founder Chairman of The English Schools Orchestra and of the League of Mercy, a charity which encourages and recognises voluntary work in caring for the sick. “Many believe he would be a perfect candidate to become a reforming minister in the next Conservative Government, bringing his years of expertise and passion for raising education standards to bear on state education." "I would like to nominate John Marshall who has had a long and distinguished political career as a Councillor, MP, MEP and now Mayor of Barnet. "John lost his parliamentary seat in 1997 during the well documented dark times for the Conservative Party, but not once has he stopped in his efforts to keep the party flag flying. He works tirelessly not only for his residents in the Hampstead Garden Suburb and Barnet as Mayor, but also for the Finchley and Golders Green Conservative Association of which he is the President and in the schools where he is a governor. "Outside of politics John is very committed to his charitable work - notably for the North London Hospice - and he has raised a substantial amount of money over the years. I think he would be an excellent Peer of the Realm and a great asset to the Party in the Lords." A one-time councillor in Aberdeen and Ealing, Cllr Marshall was MEP for London North between 1979 and 1989, and then MP for Hendon South between 1987 and 1997, before being elected to Hendon council in 1998. A former stock broker, he is now a financial journalist. "Given the impending link-up between the Conservatives and the Ulster Unionist Party, it would seem appropriate that Sir Reg Empey, the UUP leader, be a Conservative nominee to the House of Lords, where he would be able to sit alongside his predecessor, David Trimble. "Sir Reg has a long history of political involvement in Northern Ireland stretching back to the 1960s and is currently minister for employment and learning on the Northern Ireland Executive. As such, given his duties on the Executive and in the Assembly, I don't imagine he would be seeking a seat in the Commons, but it would be useful to be able to call upon him and his expertise in the Lords from time to time. "He is a two-time Lord Mayor of Belfast who has played a key role in UUP negotiating teams over the last two decades and he has a hinterland in the retail business to boot." "I would like to nominate Jill Kirby, the Director of the Centre for Policy Studies. Not only has she done a fantastic job moving the CPS ahead, she is a long standing writer and national expert on family and welfare issues. She is just the sort of thoughtful and considered person we should be appointing to the Upper House. "For the last six years Jill has been putting the case for families with Broken Hearts: family decline and the consequences for society in 2002, Choosing to be different: women, work and the family in 2003, The Price of Parenthood in 2005, The Nationalisation of Childhood in 2006 and Who do they think we are? in 2008. She has also found time to serve on the Conservative's Tax Reform Commission and was also a Consultant to Renewing One Nation, the social affairs unit at Conservative Central Office. "It's not just about Jill's work - it's also about her impact. Jill is a game changer. Her work on family issues (particularly Broken Hearts and The Price of Parenthood has changed significantly the terms of the debate on the interaction between family and the tax/benefits system. When first published in 2002, this was seen as the preserve of the green ink brigade. Now it is mainstream - at the heart of modern Conservative Party thinking. Even the Labour Government has started to understand that extra support for single parent families creates perverse and damaging incentives. "A lawyer by training, Jill's rare combination of legal background, forensic examination of deep social and governmental trends, her strong conservative principles and her dispassionate yet forceful delivery is unique – and one which would be of great value in a reforming chamber." The BBC reports: "Berkshire MP Martin Salter has revealed he will stand down at the next General Election after 12 years in his seat. Mr Salter, 54, who has been the MP for Reading West since 1997, said he "had no desire to be rattling around the House of Commons in his 60s"." Alok Sharma can be forgiven a smile this evening. "My nomination goes to Cllr Edward Lister, the Leader of Wandsworth Borough Council in London. "Edward has led one of Britain’s best performing local authorities for over a decade. In that time, he has continued to drive the delivery of quality services and still charge the lowest council tax in the country. "The Conservatives stormed to power in Wandsworth Town Hall in the late 70s.They held power during the 80s in the face of bitter Labour opposition and challenge, and have continued in power with ever larger majorities. In the 90s and 2000s, Conservative rule in Wandsworth has resisted the temptation to ‘consolidate’, but continued to seek improvement. "Edward’s leadership is one marked by the constant search for improvement and further innovation across all areas. I would draw particular attention to the Borough’s outstanding Housing Department, which is unrivalled for the maintenance of its estates, for its efforts to tackle yobbish behaviour and crime, and support community initiative and endeavour. Five years ago, they turned disused space on estates into flats under the Hidden Homes Initiative. At every election, the Conservatives have strengthened their position – even though at the 1997 and 2001 elections the Borough returned three Labour MPs. "Edward would make an outstanding contribution to Parliament’s Upper House. As one of London’s longest serving and most effective civic leaders, his contribution to debate and policy would be wide-ranging. His sharp mind and endearing manner would be an asset as we steer legislation through Parliament to repair the ‘broken society’ and rebuild civic institutions. "In light of the recent splash of slease, the Upper House needs new peers like Edward, who with outstanding track records and experience outside Westminster, would do much to restore the reputation for probity, reasoned debate and integrity that the House of Lords traditionally has held." For candidates wanting to launch or improve their website we can only recommend that you take a look at Charlie Elphicke's excellent new website as he seeks to become the next MP for Dover and Deal. As well as being technologically up-to-speed it emphasises local issues and campaigns. The ChatMap is perhaps the most interesting feature. "The blog is based on a map, so people can zoom in, click on a flag and see right away what we've been up to in their area. On the "ChatMap" anyone can put a marker onto a map and raise any issue they like for discussion and comment. Anyone can leave a comment pretty much anywhere, make a donation by text message, get involved in polls, sign e-petitions or get active in helping to change things. For those interested, newsletters, policy papers and press cuttings are also available." The challenge for Charlie - as with all websites - will be to keep it regularly up-to-date. "I have a slightly left-field nomination for the House of Lords: Sir Jonathan Sacks, the Chief Rabbi. "I wouldn't expect him to take the Tory whip - most likely he'd sit as a Cross Bencher - but he is one the most interesting social commentators out there, would help promote the social justice agenda and show that David Cameron is taking the role and independence of the Upper House seriously. "He would be a thoughtful, insightful and important contributor to any legislative debate, and that, ultimately, should be what appointments are all about: one of the most serious errors of the Blair/Brown years has been to reduce the quality of legislation. David Cameron must not repeat this mistake, but should look to improve the quality (and reduce the quantity?) of legislation. Sir Jonathan's appointment to the House of Lords would be a good start to that process." Sir Jonathan is one of several distinguished figures to have featured in this series on the basis of being a likely nominee to the Cross Benches who has a conservative world view. It is worth noting that he was the only religious figure to feature in last year's Daily Telegraph Top 100 Right-Wingers (at Number 30). Tim Montgomerie responds to Louise Bagshawe's claim that opposition to the A-list is his "one blind spot". "In the past, Conservative associations did indeed prove themselves less trustworthy than voters at large by selecting 91% white men in our best seats. that is what David Cameron called a scandal. He was right to do so and right to act." David Cameron has presided over a significant centralisation of power as party leader. There are many evidences of this but interventions in candidate selection - particularly in the MEP process - stand out. John Maples even suggested he quite liked the idea of being 'selection dictator'! There may have been good reasons for David Cameron to choose control over trust. Centralisers can always find reasons to increase their control (eg local governments aren't responsible with money/ schools aren't teaching the right subjects/ NIMBYs are blocking urgent infrastructure projects/ Tory members are prejudiced). The point of Wednesday's post wasn't so much an analysis of David Cameron's reasons for limiting Association freedoms. It was a simple statement that Britain's Prime Minister-in-waiting may be promising to decentralise but he has centralised as party leader. That may not be relevant. I think it is. The ensuing discussion, of course, became less about that argument and more about the A-list and its merits. Let me use the rest of this post to say why I still regard the A-list as an insult to party members and our party's meritocratic traditions. A narrow definition of diversity: We need more women MPs. We need them on grounds of fairness but also because a debate involving women is richer than one without. We also need more people from public sector backgrounds and people with experience of the voluntary and poverty-fighting sectors. I do not think it is helpful that quite so many Tory MPs are from the City, law, the south and from private schools. True diversity is about more than more women. If diversity was a key aim its criteria were too superficial. ConservativeHome's own campaign to help lower income candidates has been consistently overlooked by CCHQ. Quota-based systems are rarely meritocratic: Was the A-list (or Priority List to give it its official title) a list of the best possible Tory candidates? There were always going to be suspicions attached to a list of fifty men and fifty women. Those suspicions grew when it was discovered that of the 68 first wave A-listers who had fought seats at previous elections, 22 had achieved swings above the national average swing but many more (46) had achieved below-average swings. Badly implemented: The A-list would also have had more credibility if the process for getting on to it had been seen to have been more trustworthy. The interview experiences of A-list applicants varied hugely. The process was not consistent and was not seen as just. One person who reportedly failed his PAB still managed to be A-listed. Implementation problems continued once the A-list was up-and-running. Many Associations - particularly harder-to-win seats - received an inadequate number of applications. This poor choice for local Associations forced a big increase in the number of A-listers and also relaxation of the rules to allow more local candidates to apply. The A-list didn't address the real problem; A shortage of females wanting to be Tory candidates: When, Louise, you attack party members for choosing so many male candidates it is also important to remember that members haven't been selecting a preponderance of men from a candidates list of 50% men and 50% women. Even after many men were 'delisted' in 2005 there were still 73% men and 27% women on the overall candidates list. Before the culling you probably had many more men for Associations to choose from. This puts activists' choice of selections in a different context. When Associations get good candidates before them they often choose regardless of gender, sexuality and ethnicity. Windsor chose Adam Afriyie, Cambridgeshire NW chose Shailesh Vara and Witham chose Priti Patel. Nick Boles won the selection for Grantham. Nick Herbert for Arundel and South Downs. I could go on! These are all safe seats and a refutation of the nasty argument that Tory Associations are stuffed with untrustworthy and prejudiced people. The overall low proportion of female and ethnic candidates on the list in the first place is for me the most important fact. Let me say it again: When Associations get good candidates before them they choose them, regardless of gender, sexuality and ethnicity. When CCHQ rushes women or ethnic candidates into selection battles before they are ready, the cause of greater diversity is harmed as well as the reputation of the individual candidates themselves. Think Tony Lit. Think Adam Rickitt. I don't doubt that there have been occasions when some members of some Associations have exhibited prejudice but that's not the main challenge. The biggest challenge for the party is to encourage more women, more ethnic minorities and more people from other backgrounds to actually join the candidates' list. That challenge is made harder when rank-and-file members are presented as neanderthal in their views. They are not. The Tory grassroots loved Britain's first woman Prime Minister. They voted overwhelmingly for David Cameron's change message in the leadership election that party high-ups sought to exclude them from. The safest seats are choosing ethnic minority candidates, women and gay candidates. Without expectation of office or reward, tens of volunteer activists work hard for a change of government but they are increasingly denied a full and fair say in the selection of candidates. The vast majority of Conservative activists are good, reasonable people and the A-list was an insult to them. 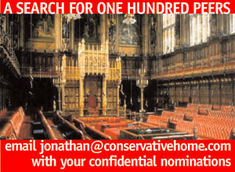 PS You kept complaining about the lack of women in ConHome's search for 100 peers. Looking at the nominations still to be posted I think we'll end up with about 25% women nominations and more than 10% ethnic minority nominations. I don't think that's bad given the dominance of men in the public square today. I certainly don't think that it's evidence of prejudice. These are nominations. If members were actually asked to vote on the nominations who knows what proportion of women they'd actually choose. PPS Happy for you to have a full right of reply in a post of your own if you'd prefer that to the comments thread." "I would like to nominate Councillor Ashley Dearnley, leader of Rochdale Council Conservative Group. He has kept the Conservative Party’s profile high and is respected and liked by all his colleagues at Rochdale Town Hall. "First elected a Councillor at the tender age of 21, he has held his seat for 29 years, (no mean feat in Rochdale!). He was Mayor of Rochdale 2005-6, and is a true gentleman, with high ethics. Ashley was on the board of Springhill Hospice for 8 years, was the founder member of “Shopmobility” in Rochdale and has been a governor of both St Andrew’s C of E (30 years) and St Mary’s Roman Catholic schools (26 years). He instigated the 6th Form at Wardle High School which was opened in 1995 with a special event held by the Headmaster in Ashley’s honour for all the hard work he had done to bring it about. "Among his many other commitments, he is on the Diversity Committee and has worked very hard to help the various ethnic minority groups in Rochdale. He is invited to, and attends many of their events. Ashley has spent most of his adult life promoting the Party with dignity and an unmistakable loyalty that people of all political persuasions have recognised and respected. "He would be a great asset to the House of Lords. He is ordinary and unassuming, but wise and experienced, honourable and incorruptible and, in a lot of people's opinion would be an excellent Peer of the Realm." "I do not know of anyone who would be better suited to the House of Lords than Patience Wheatcroft. "Who better could we have in the Lords than someone who has been an editor of a national newspaper [the Sunday Telegraph], held the Government to account through her columns, been the bain of Gordon Brown’s life when business editor of the Times and then called in to help clean up the mess left by Ken Livingstone at City Hall. Boris recently described her as a 'pit-bull of probity'. "With a journalistic nose for knowing what just doesn’t sound true, for her business experience both as a journalist and as a business woman, with her extensive experience of the voluntary sector – and having been an active Conservative all her life, not least as the wife of a former Conservative councillor – what better qualifications could we want? "I would vote for Baroness Wheatcroft of Probity!" David Curry MP is to stand down at the next election - vacating one of England's most beautiful seats and his projected Tory majority of 11,480. "Skipton and Ripon MP David Curry has announced that he is not to stand at the next general election. Mr Curry was first elected in 1987 to the constituency which, at 900 square miles and straddling the Pennines, is one of the largest in the country. Mr Curry was a government minister under Mrs Thatcher and John Major. Following the Conservative defeat in 1997 he has twice served in the Shadow Cabinet and has chaired the Environment, Food and Rural Affairs Select Committee as well as a number of all-party bodies. Aged 64, Mr Curry has told his Association that he had either to decide to quit while he had the health and energy to tackle other activities and to meet the demands and the pleasures of a growing family (Mr Curry’s seventh grand-child is expected in June) or to face the prospect of remaining in Parliament into his 70s. “Deciding when to quit is one of the most difficult judgements in many professions: in politics, which takes such a huge part of one’s life, it is particularly difficult,” Mr Curry admitted. He added: “A new generation is now at the helm of the Conservative Party – a very able generation under an outstanding, determined and exciting new leader whom I support strongly and who will be Britain’s next Prime Minister. Mr Curry said that he would continue to work at full pace in Parliament and the constituency until the general election. He emphasised the “visceral bond” he felt for the people and landscapes of the constituency. He commented: “I shall always feel a special bond with the people and landscapes of this constituency and I have never lost the sense of pride in representing such a “very special part of England.”"
"I am writing to you in response to your appeal for suggestions as to who David Cameron should nominate as Conservative working peers after the next election. "I wish to put forward the name of Patrick Nicholls, who was from 1983 to 2001 the Member of Parliament for Teignbridge. "During his time in the House, Patrick served as an Employment Minister and an Environment Minister under Lady Thatcher, a Vice Chairman of the Party under John Major and as a Shadow Minister for both Agriculture and Culture, Media and Sport under William Hague. "Even though he has been out of the House of Commons for eight years, Patrick is still only in his late 50’s. He is now a respected freelance journalist, and writes and lectures extensively here in Europe and America. He has boundless energy and enthusiasm for the Conservative cause and a deep love and knowledge of Parliament. "In short, he has a range of talents and accomplishments that would make him an ideal working peer." Will the Cameroons really trust the people? "Progressive Conservatives have taken an enormous amount of trouble over the last couple of years to develop a policy programme which is post-bureaucratic – a programme that involves the establishment of frameworks rather than the use of centralised micro-management, the provision of incentives rather than the regulation of processes, and the use of politics to encourage cultural change rather than reaching for new legislation at the drop of a hat. This recognition that we are now in a post-bureaucratic, open network age, in which government and the public services need to have a far more open texture, is also profoundly liberal." "Regulation of processes" and "New legislation": The party may not pass legislation but rules were introduced that scrapped the involvement of members in the decisive stage of MEP selection (the part where sitting MEPs were readopted). Hustings were banned to avoid "contentious debate" over Europe. Women received higher rankings than men even if they received fewer votes. And in a snub to any idea of transparency CCHQ refused to publish the number of spoilt ballot papers and the number of members who had voted. "The use of centralised micro-management": The selection of Westminster candidates has been less bad but Associations have only been allowed a free choice of candidates if all local members are excluded from the final stage of the selection process. Otherwise they are required to use half-women shortlists. Associations are instructed on the kind of candidate that CCHQ wants. You can, of course, make an argument that Conservative Party members cannot be trusted to freely make selection decisions but, then again, you can always find arguments and circumstances that justify distrusting people.